There have been more than a few awful people working on Wall Street and in the financial world. Bernie Madoff comes to mind. He ruined the lives of quite a few people with his colossal Ponzi scheme. The predatory lenders that created the U.S. housing crisis might also qualify. How about the guys at the top of Enron who sold boatloads of shares while the employee pension plan was directed into the sinking ship? All of them terrible, but none of them compare to one particular “financial adviser”….Osama bin Laden. In 2010, bin Laden and al-Qaida came into a $5 million cash windfall. Where did it come from? Ransom proceeds from a kidnapping. Noble work if there ever was some. Bin Laden had some very specific instructions on where that money should be kept for safe-keeping. He insisted that at least one-third of it be invested in gold. In terms of buying gold, the overall price trend is upward. Even with occasional drops, in the next few years, the price of gold will probably reach $3,000 an ounce. OK, enough about bin Laden. Thankfully, he’s resting at the bottom of the sea. With the Midas metal just having its best quarterly performance in 30 years (up 17%), there are some indications that $3,000 per ounce (or more) may yet see the light of day. Gold prices peaked in September 2011 at just under $1,900 an ounce. That peak marked the commencement of a pretty nasty bear market that lopped the price of gold in half. That peak was 55 months ago. Interestingly, it seems that 55 months is roughly the median length of a bear market in the price of gold. 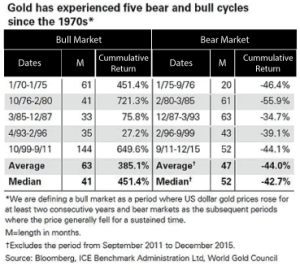 In the five bear markets that have occurred in gold since 1970, the median duration has been 52 months and the median decline 42.7%. If we assume that the gold bear actually did end in December 2015, when prices started increasing, that would put that bear market at 52 months and a 44% decline. Those numbers are both nearly right on what we have historically experienced. If, in fact, we have started a new bull market for gold, our experience since 1970 would suggest we will easily be seeing bin Laden’s gold price target of $3,000 per ounce in the coming years. A bull run that equals the median of the past five (451%) would see gold prices up around $4,500 per ounce in the next three or four years. Can be sensibly borrowed against. Today, though, as a Canadian, I am faced with a problem. I think that the real estate up here is just too expensive to buy. I’ve benefitted from the price appreciation with the real estate I own, but incredibly low interest rates have pushed those prices to unreasonable levels. [Central bankers] pull forward the fun things like consumption and push out in time the bad, necessary things like corporate failure. So perhaps now the good stuff pulled forward is ending and the bad stuff pushed out is upon us. Housing prices that we should not have seen for many years are upon many of us up here in Canada. Those prices have been pulled forward. It is amazing how big of a mortgage you can afford when interest rates are a third of the historical average. Grant was referring to Canada’s real estate specifically, but his explanation applies to gold, too. For the last several years, Grant has been very bullish, and therefore wrong, about gold prices. Based on the data presented above, it is quite likely that he is about to become very right. You may have followed the shocking collapse of Valeant Pharmaceuticals in recent months. From $260 per share, Valeant is now fighting to hold $25. A lot of pretty sharp investors have been burned badly by this one. Back in 2014, Jim Grant was telling people to stay away from Valeant and that shorting it could be a very profitable venture. Grant was very right about Valeant, but for the better part of 18 months, he looked very wrong. From his initial bearish call on Valeant, the stock is down 80%, but in the first 18 months after his call, it was up almost 70%. Mr. Grant had to endure a lot of pain before being proven correct. And for the past four-plus years, Grant has been very wrong about gold. His message, though, has not ever waivered during this time. Grant has repeatedly stated that while he did not understand why gold was falling, he absolutely knew that all of the elements were in place for gold prices to rise. My point to all of this is that Jim Grant and a few other very smart investors have a habit of being proven right over time. It often takes patience for what they are predicting to occur, but it usually happens. Calling Treasury bonds a screaming buy when they were yielding 13% in the early 1980s. The rest of the market was screaming then too, but the market was screaming that “Cash is trash” and that everyone should take no part in currency-based investments. It took some time, but Grant was proven correct about Treasuries. In 1999, when tech stocks were at absurd valuations, Grant said, “Great booms… produce large abuses, which usually do not seem abusive until after the up cycle ends.” He had been trying to convince people to avoid the tech sector since 1997. It took some time, but Grant was proven correct about the tech bubble. Starting in 2005, Grant told his readers to short the securitized lending market, or at the very least avoid exposure to it. It took some time, but Grant was proven correct about the housing market. With the benefit of hindsight, none of these calls by Grant look particularly difficult to make. At each point in time, though, Grant’s opinion was certainly not the norm. It could very well be that three years from now that it should have been obvious that gold was about to go on a tear in early 2016. I mean negative interest rates, a flip-flopping Fed and a near decade of financial experimentation would seem to be the perfect recipe for a huge burst in demand for gold, wouldn’t it? Markets can do funny things for longer than we expect, but ultimately, actions do have consequences. P.S. History proves there’s no better way to preserve your wealth than owning gold. 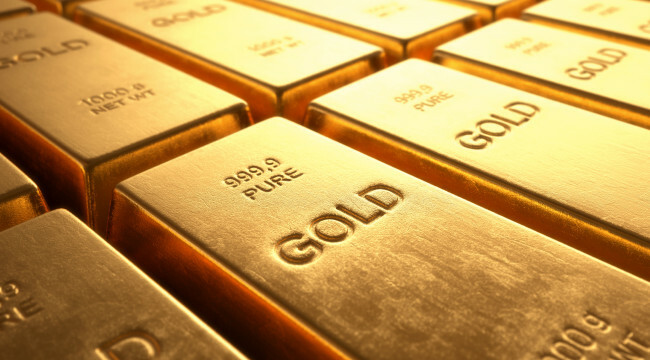 That’s why we’ve produced a FREE special report called The 5 Best Ways to Own Gold. It tells you everything you need to know about owning gold. We’ll send you your report when you sign up for the free daily email edition of The Daily Reckoning. It combines hard-hitting information with charm and wit to bring you a unique perspective on the world. Click here now to sign up for FREE and claim your special report.